The Atlanta Press Club Debates were held Oct. 2 for Public Service Commission District 3 and District 5. 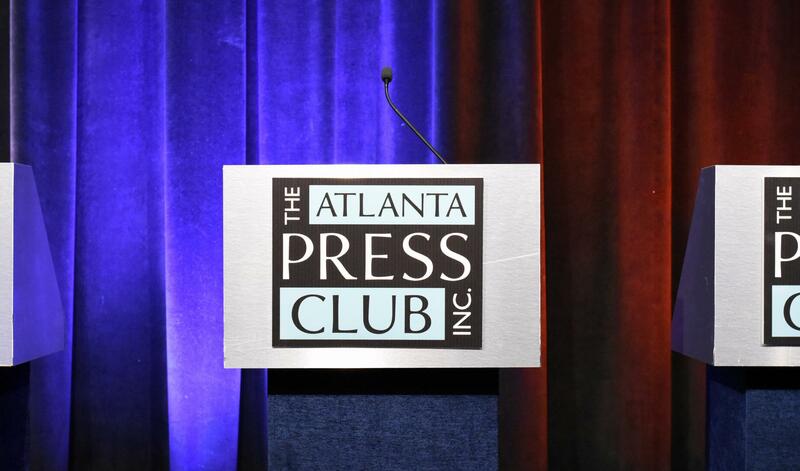 Transparency, utility rates and the future of Georgia’s behind-schedule and over-budget nuclear power plant construction were all big topics during the Oct. 2 Atlanta Press Club Debates for Public Service Commission District 3 and District 5. The moderator for the District 3 debate was Tom Baxter, a columnist with the Saporta Report, and the panelists were Kristi Swartz, a reporter covering utilities and energy in the Southeast, and GPB’s Ross Terrell. The District 5 debate was also moderated by Baxter and the panelists were Swartz and WABE reporter Molly Samuel. District 3 includes Clayton, DeKalb, Fulton and Rockdale Counties. The candidates are Republican Chuck Eaton, who currently holds the position, Libertarian Ryan Graham and Democrat Lindy Miller. One of Graham’s campaign platforms is increasing transparency and accountability for the five-member body. When asked about the large amount of information submitted to the PSC under trade secret protections, Graham said some proprietary things need to be kept under wraps, but more needs to be shared with the public. Eaton, who has served two 6-year terms on the PSC, said in the coming years he would like to see Georgia Power continue to diversify its energy sources to keep power bills low. “I would like to see all forms of generation in the mix: natural gas, nuclear, solar and other renewables,” Eaton said. “We’ve been able to protect the ratepayer, our bills haven’t gone up one dime in the last seven years, our rates are well below the national average and I think we need to continue that. Later in the debate, Miller claimed during Eaton’s PSC term electric bills saw an increase of over $30 a month and asked Eaton why Georgians should elect him for a third term. Eaton said he thought Miller was referring to the fact Georgians live in the “hot, humid Southeast” and that Georgians would pay more for air conditioning in some place like Maine. Miller, who is opposed to the rising costs of construction at Plant Vogtle, said commissioners need to put a cap on new construction spending to protect Georgia consumers. The deal Miller is referring to was between stakeholders Georgia Power, the Municipal Electric Authority of Georgia, Dalton Utilities and Oglethorpe Power. In August, an additional $2 billion in costs were announced. Georgia Power will take on more financial risk as the project moves forward. District 5 includes parts of west-central Georgia, from Polk County to Cobb County in the north to Harris and Peach County in the south. The candidates are Republican Tricia Pridemore, who currently holds the position, Democrat Dawn Randolph and Libertarian John Turpish. Pridemore is supportive of the Plant Vogtle deal, and she said during the date she believes construction will finish ahead of its revised schedule. Randolph, the Democrat, said she is concerned about the health of Georgia Power and for Georgia ratepayers because of rapidly rising costs. Randolph also said Georgia should invest more in solar energy, calling for the state to be producing seven gigawatts of solar energy by 2024. The Libertarian, Turpish, agrees with Randolph that Georgia should have more solar power as part of its energy plan, and added that he wanted to see more decentralized approach to the power grid and energy production. Turpish was also asked how he would bring a free market deregulatory viewpoint to a regulatory body such as the PSC. He responded that Georgia should move to having more choices for electricity providers, and that there are limits to how much the commission could change things. Pridemore, who was appointed to the position in February to fill an unexpired term after former PSC chair Stan Wise, said it is important that Georgians understand what the commission does, and that includes more than Vogtle.